This month, as the temperatures dips, we turn our focus to conservation and hurricane recovery in the Caribbean. From safeguarding marine areas from illegal fishing and development, advancing sustainable conch fisheries, protecting the Nassau grouper, preserving the Clifton Bay area, and rebuilding in the wake of Joaquin, The Moore Charitable Foundation and its Bahamas affiliate, The Moore Bahamas Foundation support community, environmental and education programs and the fragile marine environment of The Bahamas. Marine research, Protection and Education. We will be showcasing organizations that advance local marine conservation efforts around The Bahamas, and education initiatives that provide hands-on opportunities to learn about the Bahamian marine environment. Preserving the land of Clifton Bay. Focusing on protecting Clifton Bay and surrounding marine environments through proactive policy change, advocacy and education, The Foundation will highlight initiatives that encourage effective land use and habitat restoration efforts to benefit the land, coast, water and local communities. Sustainable Fisheries. We will report on initiatives that protect key species in Bahamian waters, including the Queen conch and the Nassau grouper, and assist fishery managers with best practice management of sustainable fisheries. Shark Sanctuaries. To provide sharks maximum protection from overfishing, The Moore Bahamas Foundation partners with groups mapping juvenile shark habitats and nursery sites in the Bahamas area; advocating for important shark protection laws, and raising awareness through education channels and public service campaigns. We will bring these stories to our readers. Hurricane Recovery. A new focus since the devastation of Hurricane Joaquin, we will shine light on the restoration efforts in Southeastern Bahamas Islands, building core community structures with an eye to an environmentally responsible future; and rebuilding strong homes while simultaneously creating jobs. Partners in the Bahamas whom we hope to make familiar include Bahamas National Trust, Research Foundation for State University of New York Stony Brook, Bahamas Reef Environment Educational Foundation and The Bahamas Hurricane Restoration Foundation. Tune into our Facebook, Instagram and Twitter channels to get the most out of our stories. Happy New Year! It’s nearing the end of a tremendous year, made so for The Moore Charitable Foundation and the land, water and wildlife causes we champion, thanks to the accomplishments and ongoing efforts of all of our tremendous partners. From globally recognized power houses like the Sierra Club and Waterkeeper Alliance, to small but mighty organizations such as Rio Grande Headwaters Land Trust, the groups with whom we work are making the world a better place for all of us. Our diverse partners around the world are unified by their commitment to conservation and the empowerment of the communities they represent. On a local and planet-wide scale, these groups are making an incredible impact on our future through research, collaboration, education, advocacy, policy change and outreach. Here are just a few highlights of the year. Wishing you and yours a fantastic new year – see you in 2016! This year on Tuesday, December 1, 2015, non-profits around the world will celebrate the fourth annual #GivingTuesday – a modern charitable movement designed to incentivize giving in today’s digital age. The campaign aims to achieve the global recognition enjoyed by shopping holidays such as “Black Friday” and “Cyber Monday,” and provide a meaningful balance to the consumerism of the holiday season. #GivingTuesday emphasizes support of local communities, which bears particular importance to The Moore Charitable Foundation and founder Louis Bacon. Our many partners, who conserve land, water, and wildlife habitats, benefit from the heightened recognition of their work on this day. Considering a charitable donation? Best practices can help you make the most out of your giving. Since its inception, #GivingTuesday has been extremely successful—creating more than 15.4 billion global impressions in print and social media. Each impression encourages donations of time, resources, and talents and magnifies the importance of even the smallest acts of kindness. As you consider giving this season, we encourage you to make thoughtful decisions about the causes you support and find the best ways to make your gifts count. 1. Set targeted goals before beginning your research. Because of the sheer number of causes and organizations in the world today, most accessible online, it can be a challenge to choose those that align best with your vision. Before becoming overwhelmed by the options, compose a list of the causes or issues most important to you and envision potential solutions. Searching only for the causes that most interest you can help eliminate the paralyzation of choice. 501(c)(3) status – A 501c3 organization is a U.S. nonprofit that has been deemed tax-exempt under charitable purposes by the IRS. Donations to 501c3 organizations are (typically) tax deductible. You can verify 501c3 status on the IRS website or through Charity Navigator. Transparency – An organization with a straightforward mission, clear policies and that demonstrates accountability is more likely to act with integrity and reliability. Do some research to make sure that 1) the charity follows good governance and ethical best practices; and 2) important information about the charity is easy to find. Financial records – A significant majority of an organization’s budget should support programs in order to further its mission, yet it should also invest in outreach and growth opportunities. A good rule of thumb is a budget that devotes 75% of its expenses to programs and services and 25% or less on overhead costs (including fundraising and administrative fees). 3. Assess the organization on a personal level. A meaningful conversation over the phone or in person will allow you to truly get a feel for the culture of the organization. Further investigation of the group’s goals, challenges, and achievements can prove reassuring, and investment of your time in this effort will make your contributions all the more rewarding. Any legitimate organization will have multiple ways to contact them. Pick up the phone or send them an email – you’ll be glad you did. 4. Be a partner. The best outcome of a charitable relationship is a long-lasting and mutually beneficial partnership. To bring about the most change, you must be passionate about the cause and believe an organization’s mission. Strong relationships with members of the organization can allow you to integrate your goals and communicate your insights. Whether you are an individual donor, or the Executive Director of a family foundation, these best practices can help ensure that your holiday giving makes a meaningful impact this year. At The Moore Charitable Foundation, we cherish the charity partnerships we’ve developed over the years and we believe that passionate, well-informed donors make the biggest impact. And through the years we have witnessed the amazing growth and success of our partners in the environments and communities we care most about. You can learn more at moorecharitable.org. To make a difference for the causes you care about, please help us share, give, and spread the message of #GivingTuesday this season. Callie Strickland recently represented The Moore Charitable Foundation at National Cancer Prevention Day earlier this month in Washington, DC. Callie was impressed by The Cannon Caucus Room filled with students, activists, scientists, and government officials. Bill Couzens, founder of Less Cancer and National Cancer Prevention Day, and Dr. Margaret Cuomo, Less Cancer board member and certified radiologist, organized an engaging and informative program. 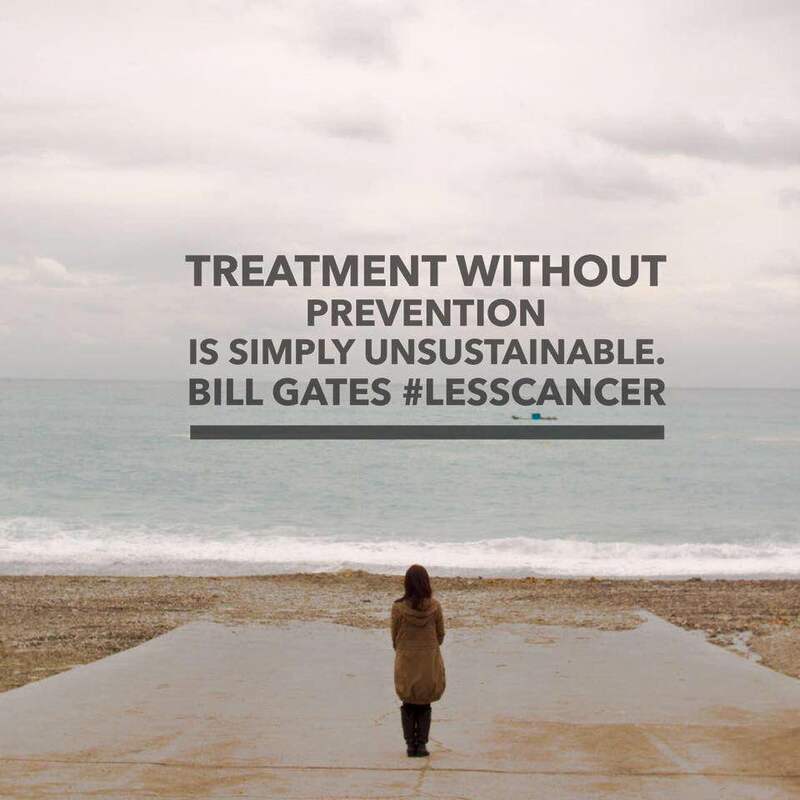 Bill shared his vision for a world with less cancer and his desire to protect future generations from preventable health risks. Jon Whelan, recipient of the Less Cancer Leadership award, exposed the “cancer loophole” regarding toxic products in the marketplace. Companies do not have to disclose dangerous ingredients, leaving consumers in the dark about health risks. Jon remarked, “Congress needs to close the cancer loophole so that we have informed consumers, safer products and most importantly, less cancer.” Veronique Pittman, Less Cancer Board Member and founder of the Green Schools Alliance, emphasized the connection between the environment and human health. She noted, “It is time to seriously reassess a culture that places more emphasis on profit than human health and the environment.” Dr. David Katz, Internist and Preventive Medicine specialist, delivered a moving speech stressing that, despite a commonly held misconception, there are many opportunities for cancer prevention. We are proud to support the Less Cancer Campaign, as it raises awareness that ultimately works to protect the environment, human health and the economy.